First introduced by Jacuzzi more than forty years ago, whirlpool tubs can bring a spa-like ambience into your family's bath. A whirlpool tub is a type of specialty tub that features water jets and an electric pump that circulates water for an ultimate relaxation experience. The suction pump of a whirlpool tub draws water from the bath that is circulating by the jets. Each jet is constricted near its opening with a mechanism that injects air into the water - the amount of which can be controlled by the lucky user. A whirlpool tub is not a spa or hot tub, and must be filled up each time that it's used. Whirlpool tubs are available in a range of colors, styles, sizes, and designs from many manufacturers. Most whirlpool tubs are constructed with fiberglass, acrylic (or a blend of the two) or cast iron. There is also a big variety of different configurations for whirlpool tub pumps, recirculation systems and jets. There are two basic types of whirlpool tubs, the drop in whirlpool tub and the alcove or apron style drop in whirlpool tub. The more popular of the two is the drop in model, which is oftentimes built onto an elevated deck, but can also be placed into the floor into a recessed, be installed in a corner or against a wall, or even stand freely in the open. Drop in whirlpool tubs can be made in a plethora of shapes, including round, oval, square, heart-shaped, diamond-shaped, and more. Many whirlpool drop in tubs can accommodate more than two people, which is especially appealing to a certain group of homeowners. The alcove model is made for a normal sized bathroom and is usually around six feet long. Alcove refers to the fact that they fit into an alcove in the bathroom, and have an apron along the exposed side that extends downward to the floor. Optimally, a whirlpool tub should be purchased and installed during construction of the home, renovations can be easily made with most knowledgeable contractors to add a whirlpool tub to any existing home. Most whirlpool tub owners choose to add a handheld spray head in either a deck mounted or wall mounted model for easy access to fill the tub and make it more usable. 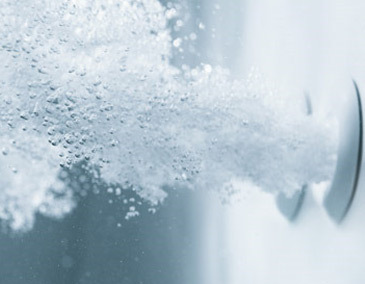 This type of spray head will also allow you to clean your whirlpool tub with ease, rinse your body, or wash your hair. When purchasing a whirlpool tub, be sure to take into consideration any safety issues. Pay attention to the safety features of the whirlpool tub you are interested in, as well as its shape and size. You should be able to get in and out of the whirlpool tub with ease. It is also important to note that due to the high velocity of water in a whirlpool tub, those with certain medical conditions or small children should avoid use. You should also check with a plumber to make certain that your water well or cistern can service the demands of filling a whirlpool tub and (for those homeowners who have a septic system in lieu of a sewer) that your system can withstand having this additional water discharge. Also be certain that the floor framing is adequate to support the weight of a whirlpool tub (which can be as much as 1500 pounds including the occupant) and that your doors and hallways (for existing structures) can accommodate the width of the tub as you bring it in for install.